A viable substitute for the real thing at a fraction of the size and price. 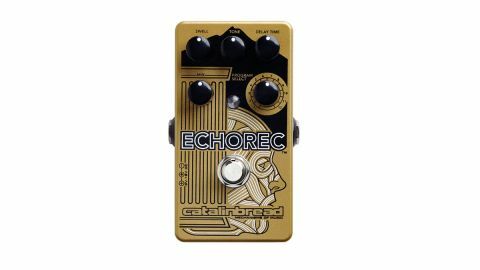 This Catalinbread pedal is more niche than the recent Hall And Collins Signature Echo, and concentrates on the sound of that most revered of drum echos, the Binson Echorec, as used by David Gilmour, among others. The pedal features a 12-mode selector dial that offers different combinations of the four heads to produce the rhythmic patterns of the original plus a few extra, offering them with a wider range of delay times (a max of 1,000ms compared to the original's 300ms). There's an excellent tone control for darkening/fattening or brightening/thinning the repeats, while an internal modulation trim-pot can add a bit of wobble if desired, simulating an ageing drum. There's also an internal gain pot that has a secret full-on fuzz setting at its extreme! Overall, you're getting a pretty close approximation to the sound of a real Echorec but with extra capability.